Firstly you will need to drizzle oil the steak, then Sprinkle the steak generously with the Old El Paso™ smoky BBQ seasoning mix on both sides; and press into the steak. Place the seasoned steak on the griddle over medium heat; and sizzle until cooked, then remove and place on a plate to the side. Then place your onion and peppers into the pan also on the griddle and cook until they go soft and char around the edges then remove from heat and keep until you’re ready to serve. Now you can heat the Stand 'N' Stuff™ Soft Tortillas, either in a preheated oven for 7-9 minutes, place seperatly and flat on a baking sheet. Also, ensure you loosely cover the soft taco’s in foil or you can heat in a microwave on full power for about 30 seconds. Once heated, remove from oven and place to the side ready to serve.You will need to slice your avocados into slices or dice into squares, then take the Steak and slice into thin or thick slices,whichever you prefer but just remember to ensure they will fit in your tacos. 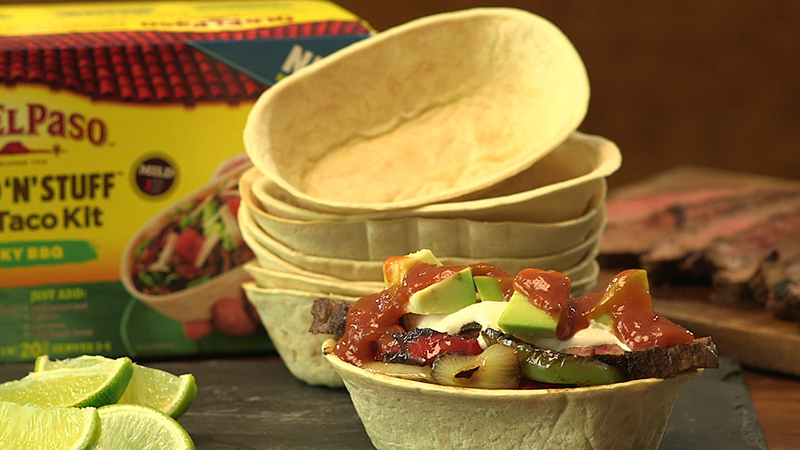 Then all you need to do is place the sliced grilled steak, vegetables and Avocado into the warmed tortillas and add any of your favorite toppings like sour cream or a squeeze of lime.